Some bugs never die. 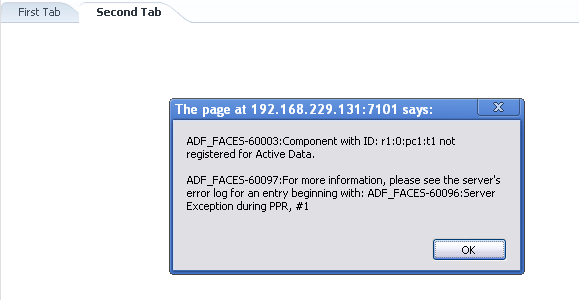 This is true for Active Data Registration error in ADF. Error happens after exporting to Excel or after uploading file and pressing button, tab, etc. as the next action after export or upload was completed. 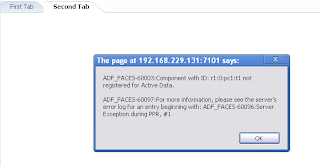 Same error happens when invoking print behavior - Issue with Show Printable Page Behavior in ADF 11g R2 (11.1.2.2.0). This is reproduced across 11g R1 and 11g R2 releases, also with the latest JDeveloper 11g (11.1.2.3.0). There are various workarounds for this issue - set Page Definition iterator ChangeEventPolicy=none or set ContentDelivery=immediate for the table, etc. There is no single workaround recipe - it all depends on ADF UI complexity. If the same bug will be reproduced in the next ADF release - I will repost it again. A bug has been reported for this one, will update after getting information from the dev team. Sounds cool - thanks a lot ! I don't see any problem not to use PPR, you can simply set PartialTrigger manually in the fragment. First of all, thanks for your great blog. It is for sure a great reference for me and my co-workers! I had the issue while navigating to another tab after an Excel export. Changing ChangeEventPolicy to "none" fixed the problem. Now, I have the same issue after doing a file download but this time, ChangeEventPolicy="none" does not fix the issue. You are using 12c? I would not advice to use current 12c, until there will be next update release. As there are too many issues. Could you try to reproduce same issue on 11g R2? we have a popup with a table and a select list that refreshes the table and export to excel command image link.We are facing the active data registration issue on the selected list after I export the table to excel and close the popup. The iterator's change event to policy is set to none. I tried table content delivery option both immediate and when available. This worked when there are less number of columns.I have 33 columns in the table. Please help me fix this issue. I know this is old post but i am facing similar issue in the above scenario. 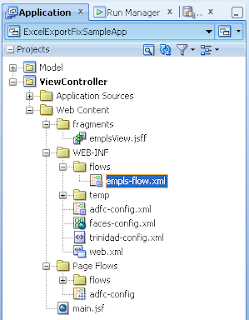 In my case in the second showdetail item i have some view object iterators and also i am executing some business logic on tab change event. can you please help me on this issue. I get "Export is incomplete due to error Index: 50, Size: 50." after the last row in the excel. Your advice is appreciated.